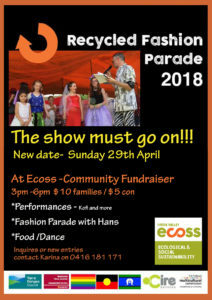 Home Uncategorized Recycled Fashion Parade 2018 – The Show Must Go On! What a fantastic Community event this turned out to be. We decided that ‘The Show Must Go On!’ – following the sad cancellation of Ecotopia 2018, we couldn’t let all the effort that had gone into creating those wonderful costumes go to waste! I would love to thank everyone for such a fantastic community event. Thankyou Kofi and Yarra Valley Drummers for kicking the night off with a bang! Brendan Jones MOOP Officer Jones, Sean Marler, and Amber Sprunt for being efficient, professional judges! Thanks to all the donators of prizes! Thanks to all the designers and contestants- AND thanks to the audience! What would a show be without an audience?! !